A sprinkle of fairy dust and a message on the hotel’s notice board had turned us from a pair of travellers into 12. We met our companions for Intrepid Travel’s ‘Explore Eastern Europe’, Code WMSY, begin: Budapest, finish: Istanbul. Neil was a retired miner and Ros a primary teacher from Queensland, Mat and Luz young Americans who celebrated their 365th consecutive day of travel a few days after our tour finished. They were still thinking about what they would do when they stopped. These four had already been on a connecting tour which had begun in St Petersburg. Marce and Claudine, role models for anyone over 45, introduced themselves as involved in motor sport. Chris lived on the shores of Lake Taupo with Jope, an engineer who had begun life in Holland before living in NZ for 30 or so years. JoNette was part of an Iowan farming family who had been doing some preliminary scouting with Lutheran contacts in central Europe. Marta in her late 20s from Poland was our guide. There are 1000 ways to travel. More. As many as you can think of. But somehow we were the customers Intrepid were expecting. They had found our pitch. Very good locations to stop, places you wouldn’t necessarily find yourself and not full of people who looked, sounded and were just like you. There was something interesting to do at each with no compulsion, lots of free time, plain but interesting and sometimes very roomy accommodation, good company, and of course someone else to worry about tickets and times. Excellent three-star tour, and I may have mentioned this before but we are three-star kinda guys. After this tour we added another couple of our stars for a week or so in Turkey, and it was great, but not any better. Name three cities in Hungary that aren’t Budapest. Okay. How about one? No. I couldn’t either. But nearly 10 million people live in Hungary, and they have to live somewhere. We went through Györ on the train to Budapest and when I looked at the name on the station I wasn’t sure what I was looking at. So, not Szeged (and I’m leaving off the complicated accenting systems here), not Nyireghaza, not Szekesfehervar, not Kecskemet, not Szombathely, not Pecs (not ‘pesht’, but ‘petsh’!). I found Veszprem almost on the shores of Hungary’s inland sea, Lake Balaton (‘Our ocean’, said Arif; and no I didn’t know that either) and felt a faint thrill as Patrick of Veszprem plays football for the Dogs, and wondered idly whether the rest of the population might have good initial pace but no real engine, no capacity to dominate a game. 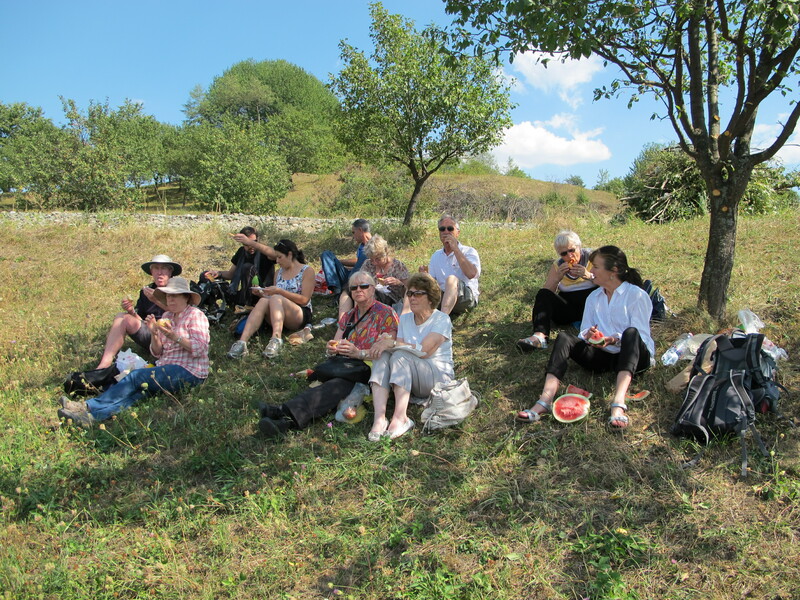 Our first stop together was Eger (‘egga’) maybe from the Hungarian word for ‘alder tree’, égerfa. Some indication of its history is that in Latin it is/was known as Agriain, in German as Erlau, in Serbian as Jegar or Jerap and in Croatian (wouldn’t you know) Jegra or Jerpa, in Czech and Slovene as Jager, in Slovak as Jáger, in Polish as Jagier, and in Turkish as Eğri. Multiple, and differing, names is a common phenomenon in this part of the world. It’s the second largest town in northern Hungary (60,0o0, after Debrecen) and has been the seat of a Roman Catholic bishopric since 1009. It has a castle designed to hold the line against the Ottomans, which withstood a lengthy siege during 1552. This nation-building event was novelised by Gárdonyi Géza in the C19th as Egri csillagok (‘Stars of Eger’), set reading for all who inhale the Hungarian national curriculum. Civics perhaps. As with many such stories, the situation was temporary. The Turks overran the castle forty years later and held it and the surrounds for the next 90 years, until of course they in turn were starved into submission by a force led by Charles of Lorraine. As is my wont, I fell asleep on the train and woke to rolling limestone hills covered with vineyards, another reason why Eger is renowned. Mixing bull’s blood into the wine of the soldiers withstanding the siege of 1552 is credited for their intransigence. 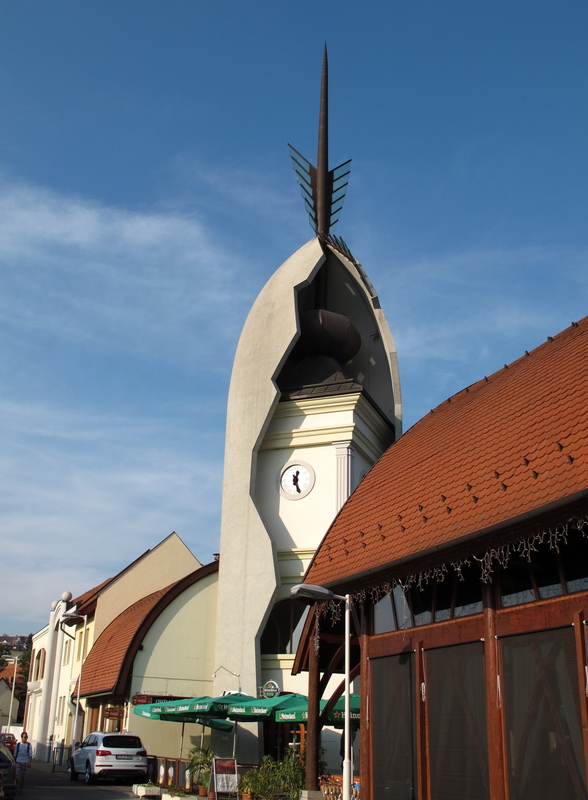 Today Eger wineries’ best known product is Egri Bikavér (‘bulls blood of Eger’). 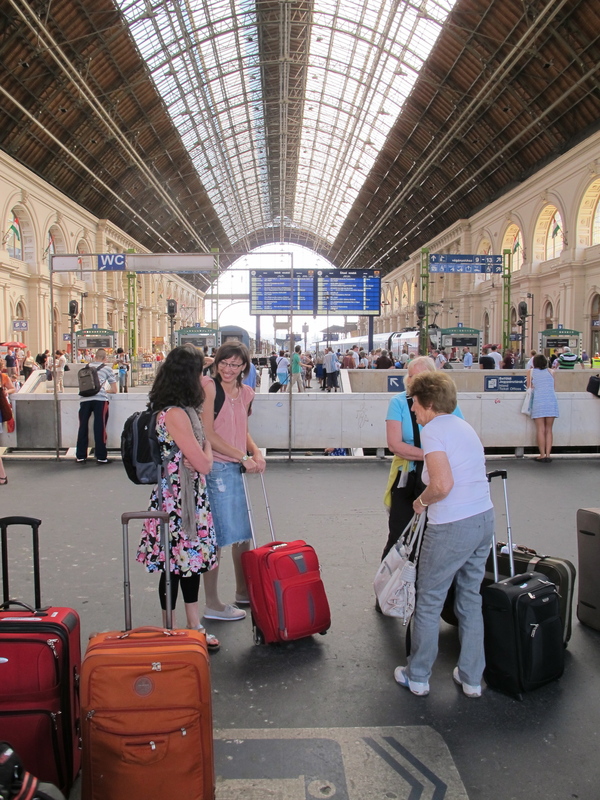 We hauled our luggage out of the train and began the walk — which became customary, the intrepid part of Intrepid travel — to our accommodation. Later in the day we went past one of those flashing time/temperature signs on a branch of Citibank which said 38 degrees. The kids in the main drag didn’t seem to be noticing. Marta did her dutiful best to tell us interesting things about the town, but I only wanted three things from Eger: a cold drink, a pair of sandals and a swim. We had lunch in one of those tourist mistake restaurants, served as and when interested by a tepidly drunk waiter, much quicker with the beer than the food. Marce and Claudine were our companions. Claudine and I discovered we may have met 30 years ago at Avila College in Glen Waverley where she had taught. And that she was a teacher of Indonesian. We ignored the castle, too hot, and staggered off to look at the northernmost still-standing minaret in Europe. Above is its base and one of those textured European walls which you can think of as shabby and derelict or characterful and beautiful ‘in their own way’. You will notice I am sheltering in the shadow of the minaret, and not only for visual effect. On one other side of the square was a room containing a hundred (or so) large things made out of marzipan, and on another again these guys working in the full sun. 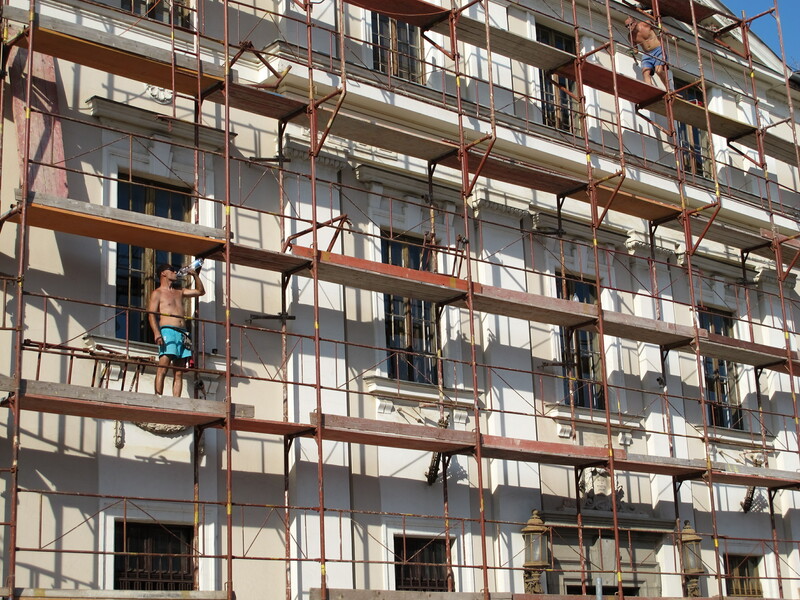 Makes a great photo but that steel scaffolding would have been stinging to the touch. We negotiated the purchase of a pair of sandals, Myrna much more gifted and active in this process than I. So much more practised and confident around a shop. We tried to bargain our way into the Lyceum. It had a camera obscura on its top floor which provided its own sort of view of the whole town and environs. It was also cool in the lofty stone atrium of this, internally at least, very attractive building. But it had closed for the day. At breakfast I had been peering over JoNette’s shoulder at her guidebook and noted there was a swimming pool at Eger significant enough for inclusion. 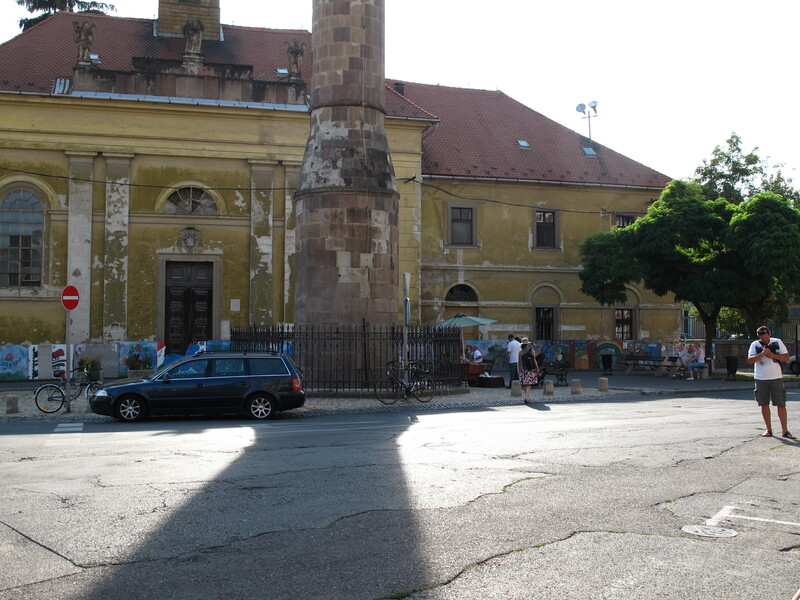 Eger is also home to a series of thermal baths, many more than I knew when I was snooping, and it was one of those we rolled up at, about 4pm on a very hot afternoon. Closed for the day. Finished. Over. How could that be? 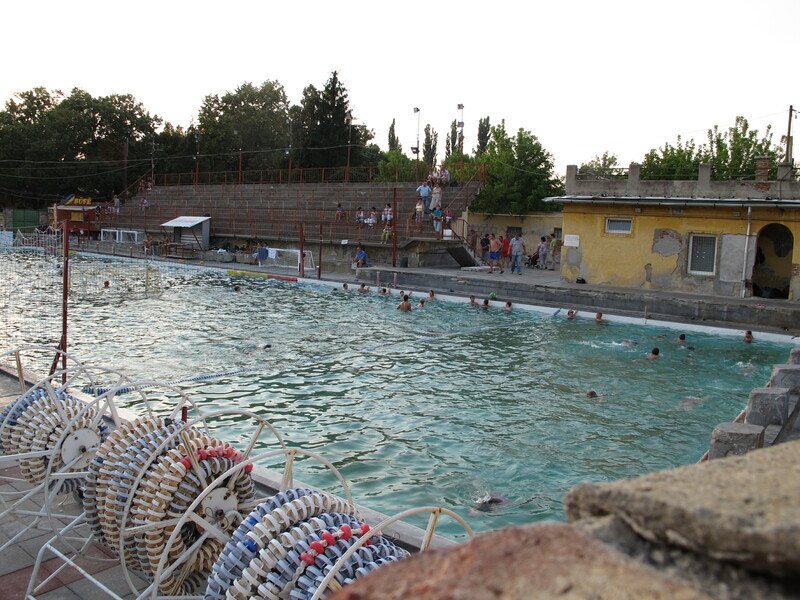 Where were the junior denizens of Eger busting for a swim? Was Hungary (whispering only) not very sporty …? And number two. Hungary not being very sporty. Well I beg your pardon! “It is no exaggeration to say that Hungary is a genuine sports power. The last century not only abounded in the country’s outstanding individual accomplishments, but also in acclaimed team successes. With 465 medals, Hungary is ninth on the all-time Olympic medal table as the most successful nation that has never hosted the summer Olympics.” (Read more here.) 465 medals I thought. Wow. (Australia 468, and Hungary doesn’t even have beaches …) That will be fencing, modern pentathlon, shooting, proper Magyar sports, and yes water polo. I was right about fencing and modern pentathlon, but swimming and canoeing are big too. Quite a spread of success across sports in fact. But water polo, mate … . Hungary has sent a water polo team to 20 Olympic Games for 3 Bronze, 3 Silver and 9 Gold medals. Fifteen medals, nine gold from 20 starts. More than twice as many gold as anyone else. As we walked home from the pool we went past a group of huge strapping lads who I took for a particularly well-fed visiting African soccer team. (They were many attractive shades of brown.) As we came closer I noted they had Hungary Water Polo logos on their T-shirts. We found the entry, the door anyway. 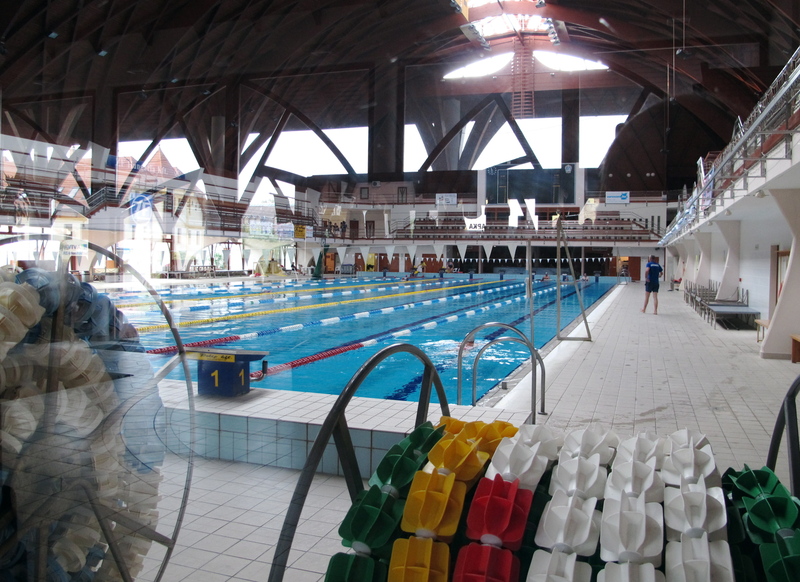 As in a number of European pools we have encountered, actual entry is a different proposition. There may be a circulation system so you risk entering the exit, and can you use money or do you need to buy a token of some sort which may or may not be related to entry or a locker? At what point do you take your shoes off, and is there a bath of disinfectant for your feet? If so, where is it and at what point do you use it? If you would like to take your stuff onto the pool deck are you allowed, and if you’re not what else do you do? And anyway where’s the door to the pool deck? Back the way you came? Maybe on the other side of the showers so you can’t avoid them. And is that guy the attendant, or on the brink of a proposition? And you haven’t even got your togs on yet! Wait for the mayhem when you start swimming on the wrong side of the lane. At this pool, where they hold the national swim meets, we first had to persuade the entry lady that we wanted to swim up and down with some degree of seriousness. After a few minutes I said ‘Australian’ and that turned the corner for us. We bought a token and both went in the wrong way and put our tokens in the exit slot which meant we weren’t issued the wrist band with an allowance for a locker key on it. Had to go round again. I left my shoes on way longer than I should have and the guy watching me did turn out to be the attendant and he sorted me out and gave me a box to put them in. And then there was the locker. I matched numbers and felt pretty smart about that, and found the foot bath but couldn’t work out how the hell to get from where I was to the pool. All hygenic and ready to swim and just nowhere to go. And then I did spot a door nearly hidden on the other side of the showers, tried it and there I was, an international representative. The photo above says there were three others swimming, a dozen others in the spa and about the same number lying in the sun. Below is the pool immediately next door for the disadvantaged. That night, and I have no photos of this, I must simply gloss it, we went to the ‘Valley of the Beautiful Women’, a vast collection of caves (in the French sense) to taste their contents. I was immersed in listening to Jope telling me about thermodynamics, and energy conservation and recovery, and where he was up to with a patent for a process he had invented and so walked past the first 150 or so without noticing, but when I looked back there they were, and we weren’t even in the valley at that stage. After a low key beginning to the evening, we scrambled down 20 or so metres of steps into something very definably underground, and the resident Mama took over with astonishing zest. She was as much stand up comic as vigneron and soon we were roaring. She also had some very fine red wine up her capacious sleeves. It was a long but slightly cool and very lovely walk home. There are records of this evening. I was unable to destroy them all. I would have been happy to spend more time in Eger but it was only a way station en route to Romania. Next morning it was still hot but cooler with a dirty grey European haze, part moisture part suspended solids. We got up early to walk to the bus station and waited anxiously in the large crowd, much more than a bus full, who appeared to be going in our direction and by the same means. As it turned out, Marta must have charmed the bus driver another time — this is what a guide is for you see — and he loaded our luggage and then let us get on first leaving 15-20 people, seemingly part of a tour, and older, standing in the aisle. I would like to say I stood up and gave them my seat but I didn’t. Mat and Luz did. No opening windows, but no air con either for the three-hour trip. The countryside we were passing through reminded me of the Wimmera (the region in western Victoria where Myrna and I grew up). Central Europe has had various versions of drought for eight to ten years and this area had the same sort of burnt out quality as the Wimmera and Mallee in late February along with the same huge skies. The crops were not wheat and barley however, but corn and sunflowers, and harvest was well over. The houses were not mansions but perfectly presentable. This car may have been a Trabant. Debrecen (‘dubrretsin’) I knew from the produce of one of the most popular stalls at the Vic Market, the hot dogs near the entrance to the deli section. They offer bratwurst, sometimes weisswurst, beef, spicy and debreceners. 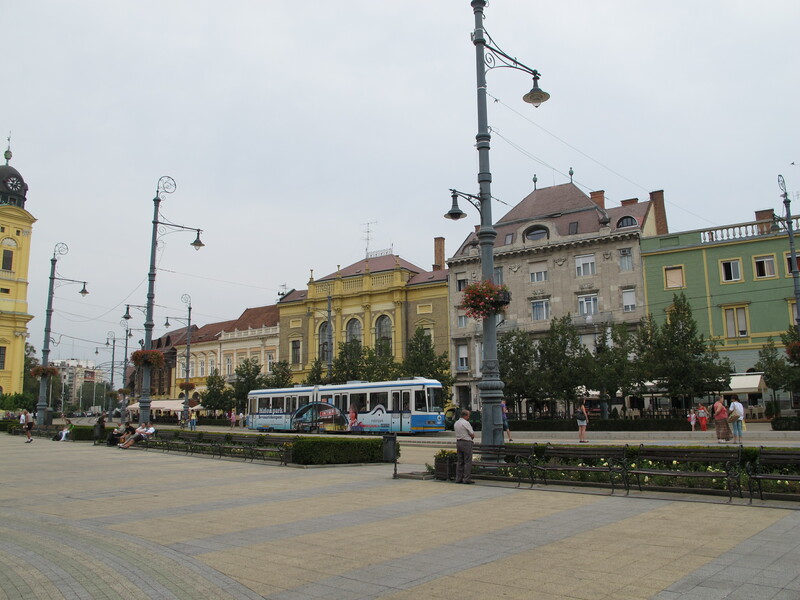 Debrecen is the second largest city in Hungary (a bit over 200,000) and for a short time in the C19th was its capital. It has had a tertiary education institution since 1548 (the Calvinist College) and is still a university town (the University of Debrecen). It had the enormous misfortune to be a military centre during WW II and was the site of a massive tank battle which was one cause of the destruction of more than half of its buildings, a fact painfully obvious from its outskirts. Communist architects have their way with a tower block, and the reason they go so bad can only be put down to the people who live in them. (Yeah sure …) But the town’s centre has been restored and was quiet, open and gracious. It was difficult to imagine this on a hot summer afternoon in 2012, but this is the very first site of the uprising in 1956, as bloody here as elsewhere. We only had a few hours in Debrecen, an interlude: enough to eat really well, buy some ice cream, look for a market and not find it, and go to the art gallery (which only had three pictures to look at, all by Munkácsy Mihály. This will be discussed further elsewhere). We took a tram to the station and got on with the next leg of a big day of travel which was a long way from over. We were still on the Great Hungarian Plain, also known as the Pannonian Basin and extending into six countries including Romania. The Carpathians are shaped like a huge question mark through this region with the full stop in eastern Greece. We were travelling through the area circumscribed by the big curl and heading for its apex in the Ukraine. It was still hot and flat. There was only one small town in the 50 or so k.s between Debrecen and the border post at Nyírábrány (For your viewing pleasure.) which I think in Magyar means ‘nowhere’. The train stopped and we surrendered our passports, never a pleasant experience, but just for a stamp to say we’d been to Hungary and were leaving. However, Chris had arrived at Schiphol in The Netherlands and whoever was supposed to have stamped her passport there to say she had arrived in Europe had failed to do so. She didn’t exist, or if she did she was a persona non grata, unwelcome at least to leave Hungary in this indefinite condition. The train sat, and it sat. People in blue uniforms with guns came back and forth. Sometimes it looked good when the pleasant woman held sway. Sometimes it didn’t when the big bloke in the boots was deciding how the job was to be done. Chris had her itinerary, her record of travel and even her entry flight boarding pass! But to no avail. Chris was marched off the train, Marta with her. I went to take a photo of their departure out the window of the train and the large gentleman with the large gun held up his hand. He didn’t say ‘Nem’ or ‘Nincs’. He said, ‘NO’. 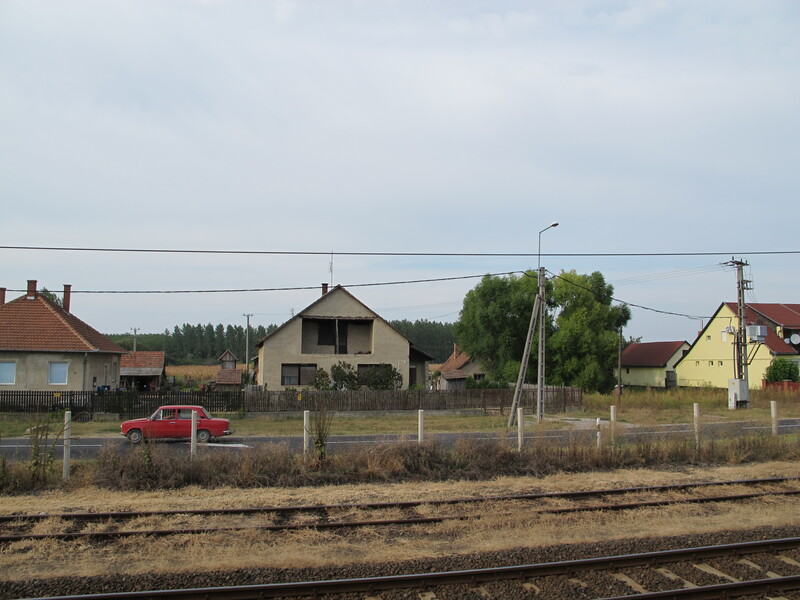 And then the train left the station heading for western Romania.